[avana Report: Cuba Easing Up On Jewish Worship? to help solve these problems." [30 pm., at the Hyatt Hotel. Inject, Women in Politics-Power,' Mrs.
oilege and Palm Beach Junior College. Organization of Palm Beach County. and a regional vice president. P8" will be May 10. Community A Partnership for Life"
The 1985-86 slate is as follows: Erwin H.
Yochai at the foot of Mt. night, a huge bonfire is lit. to his cave dressed as hunters. on May 14, from 4-6 p.m.
son hid in a cave for 13 years. There, they studied in secret. 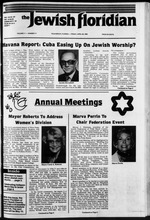 Guide to the Jewish Holiday"
Commissioners of Palm Beach County declarine the *..i . Victims of the Nazi Holocaust. Yom Ha'Shoah [HoIocm. Jewish Federation of Palm Beach County and the Holocia! Survivors of the Palm Beaches. WHAT u a Personalized Philanthropic Fund? that you wiah to memorialixe or honor. by a coeneaittei knowledgeable in the fields of finance. in i nun lint and eatata and financial planning. Contribution* may be made by you, your family. aaaociataa. friends and from corporate sources. reports on the atatas of your fund. because it is to a public charity. deductible up to 30% of your contribution tax base. enabling more funds to be used for charitable purposes. No tax returns or reports need to be filed on your fund. your payment* to charities on a regular basis. amned if they have to stop. it everybody the same way,"
l"e rest of the day." Dresden. 1 simply reported h.
of the Jewish Federation of Palm Beach County. Page 4 The Jewiah Floridian of Palm Beach County / Friday, April 26,1965________. thplace of the Jewish people,"
known as the State of Israel." corresponds to the 5th of Iyar. of giving, not to charity but to life." been restored in our lifetime. so do Jews in the Diaspora. from other festivals in Israel. so far without much success. of the festival to Pesach). MOSAIC Sunday, April 28 and May 5, 9 a.m.
WPTV Channel 5 with host Barbara Gordon. SHALOM Sunday, April 28 and May 5, 6 a.m.
of Temple Sinai, Delray Beach. American ORT West Palm Beach board 9:30 a.m.
Temple Beth David Men's Club boat ride. p.m.* B'nai B'rith No. 2939 Regency Spa Trip. of directors 8 p.m. Labor Zionist Alliance 1 p.m.
- 9:30 a.m. Hadassah Golda Meir board 10 a.m.
board 10 a.m. B'nai B'rith Women Ohav -1:30 p.m.
Resident Camping at lt very beat! Tennis 4 golf nearby. Outdoor putting grssn. LARGE pool. Discount Rates Accommodations for Singles j^. DIRECTORS: JOAN BERNIE KIRSNER ji. them to expand their programs and services. fund drive to achieve their objective. Lion of Judah event this year. Dessert will be served after the meeting. toll free 1800-432 Q853 for your copy of Funeral Arrange. gency telephone number stick on for your telephone receiver. telephone number stick on free. Mail t<> (iu.mil.in I'I,ins Inc.
officials for some 10 years. Judaism, they abo received personally inscribed menonk! Air Conditioning and Cokx TV. am), and Dinner (from 6 JO to 830 pm). VJedOTX \ Your host fr three generations. nas not quite his cup of tea. might well leave with ecru. realized he had done you in. the city with my sister and me. the world at various intervals. known he was an outsider. Israel perhaps? Not my father! week until the age of 85.
smooth. A far cry, indeed, from the strokes seen on the hack nine. wall were made by his hands. enjoy was taught by my dad. intersection of U.S. 1 and NE 22nd Ave., Boynton Beach. more information call the regional B'nai B'rith office. are inivited. There is no fee to attend. meet at the home of Sally Friedman, Building No. 14.
the home of President Fanny Schwartz. Vassil will become Chapters at the end of the Fiscal Year. days, two nights. Contact Laura London for reservations. will present the Histadrut Scholarship plaques. Beach is the incoming president of Palm Beach Council. eluding the police and soldiers. 'This is an unusual scene,"
tier side of us, he smiled. fthat day, we didn't have to. fie to ply their trade." would say such a thing." react, they don't act," he said. Present this ad at check-in time to qualify for package rate. Center, 4645 Gun Club Road, West Palm Beach. Sunrise Jewish Center among others. West Palm Beach, Fla. 33415.
entertain. Contact Lil Davis for more information. on the "Paddlequeen" complete with lunch and boat ride. 12:30 p.m. at their Clubhouse, Covered Bridge Blvd. of North Palm Beach County Region, installing. At A Board Meeting," with a cast of board members. Association on Military Trail and Gun Club Road. from a Viennese dessert table. the evening of the party. the March of Dimes office. and at least 18 years of age." they have been cultural lags. is doing the same circuit. Them," which ran this week. from New York area airports to Kutsher's! West Palm Beach at 689-7703. Meal Program, 11:30 a.m. Dr.
Hersh "Is There a G-d"
you'll love the dancing, music, cocktail parties. AMD GUARANTEE YOUR STAY AT 1984 RATES! Fritzie Karp [left] end Anna Ettleman receive awards. proud of all of you "
This special offer is only good until May 1st. Plus. Slay Two Weeks & You Get A Winter Weekend Free! to a command from above. equal citizens of the State. at his or her disposal. especially from the old days. (District VI Parliamentarian and Convention co-chairman]. Publix Bakenet open at 8:00 A.M.
concern and dedication to families in South Florida. Plan Chapel, West Palm Beach. Mincha followed by Sholosh Suedos. P'm"
Cantor Earl J. Rackoff. Sabbath services, Friday 8 p.m.
Beach 33406. Phone 433-5957. Rabbi Dr. Morris Silbennan. Saturday and Holidays 9a.m., Monday and Thursday 9a.m. Dardashti. Sabbath services, Friday 8:30 p.m.; Saturday 9a.m. 6053. Friday night services 8:16 p.m. Saturday 9 a.m..
857146, Port St. Lucie, FL 33462. Friday night services 8 pin. Satui^jnorning 10:30 a.m. Phone 466-6977. Parkway Street, Jupiter. Mailing address: Plaza 222, U.S. No. TEMPLE BETH EL: 4600 Oleander Avenue, Fort Pierce, FT.
13000 Paddock Dr., West Palm Beach. Mailing address: P.O. 33407. Phone 833-8421. Rabbi Howard Shapiro, Cantor*! laughs. The public is welcome. the plight of Soviet Jewry. WTyptAN-aUow.vou to make your choice* J^l All ol the above. Adam Magid, son of Mr.
Arnold and tony Lamport want you to know for sure. Let us review and update your existing coverages regardless of current health. A strong plan for a difficult time. at a very difficult time. LIGHTS 100's: 10 mg. "tar". 0.8 mg. nicotine. KING-17 mg. "tar", 1.3 mg. nicotine, av. per cigarette by FTC method.